We've noticed some critters around town doing damage to established and other shrubs. Does this look familiar to you? If you've seen chewed patterns like this in the leaves of your shrubs, then you've most likely been visited by the Cranberry Rootworm Beetle, or Rhabdopterus picipes. 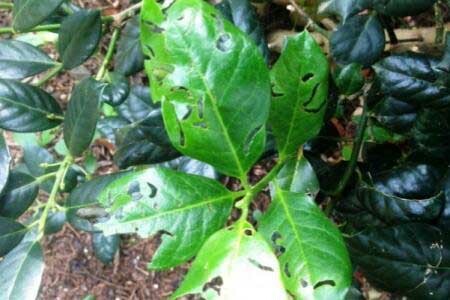 This small shiny black beetle loves to munch on the new leaves of plants like hollies, hollies, roses, camellias, azaleas and more. 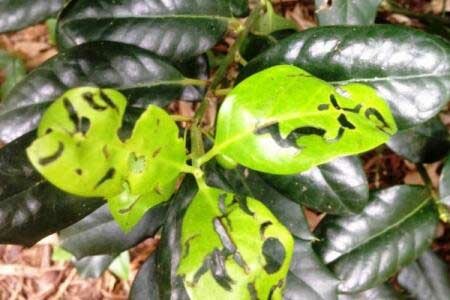 The adult beetles feed on your plants for several weeks in late-spring and summer, leaving behind a trail of ruined foliage. The damage is both unsightly and hurtful to plant growth. These can be frustrating pests to banish, as they hide in the leaf litter around the base of plants during the day, then emerge and feed on the leaves at night. Control of the adults can be challenging. Sometimes, when adult pests are difficult to treat, we turn to controlling them in their larval stages (just like Mosquitoes). The larvae of the Cranberry Rootworm Beetle, which is the Cranberry Rootworm, lives and pupates in the soil around the plants. Studies have shown that certain strains of beneficial nematodes can be used to control the larvae before they become adults. If you've had problems with Cranberry Rootworm Beetle this season, feel free to give us a call so we can help you develop a natural treatment plan. Call 972-272-9211 or contact us online.